It may be a while before I can form coherent sentences about the new house. I’d love to do a quick tour once the place is put together, but who knows how long that might take. Until then, I’ll recap the past few days with some pictures. 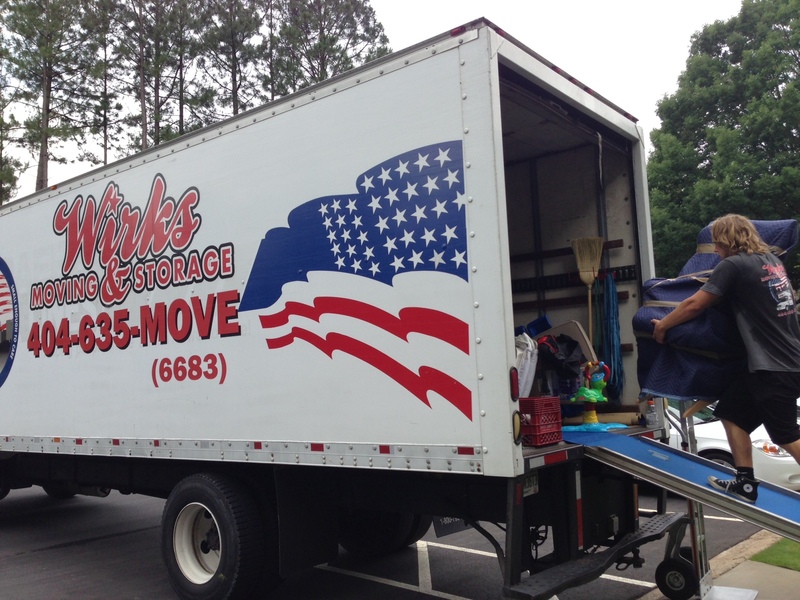 Our moving truck from Wirks Moving & Storage arrived at 8 a.m. Monday morning with three guys eager to work, despite the overly humid conditions. I haven’t moved in 5.5 years, and James hasn’t moved in 8 years, so we figured now that we have real jobs and are adults, it was worth hiring movers instead of rounding up friends and attempting to do it ourselves. Smart move on our part, because it may have taken us a full week to move everything over ourselves. Plus the Wirks guys have great expertise and efficiency taking apart furniture and putting it back together, which alone could have taken us hours and hours. Everything I had labeled went into the appropriate room, but there was still plenty of boxes and bags that didn’t make it past the garage. 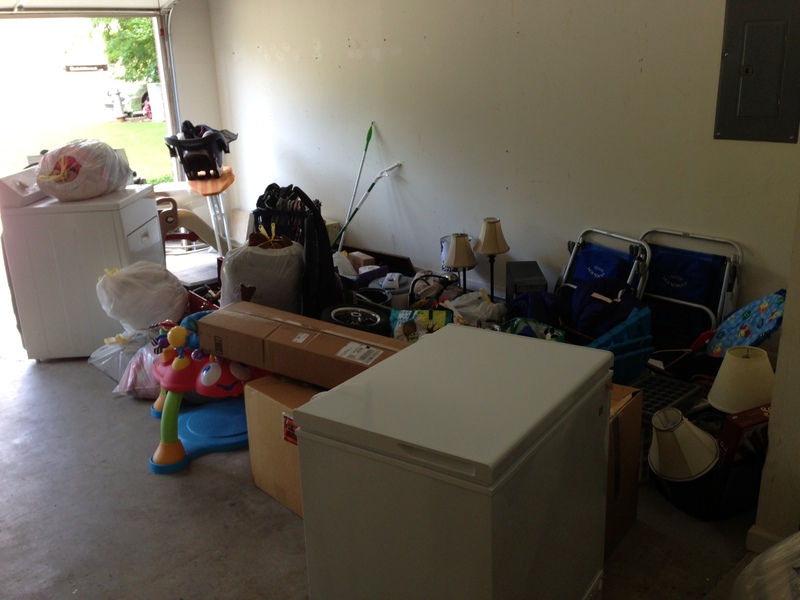 I have vowed that I won’t be one of those people who never uses their garage for storage only. Easier said than done, I know. But now that I actually have a garage, I’m determined to use it to keep the car cooler in the summer, eliminate getting soaked in the rain and avoid a frosted windshield in the winter. Having experienced those side effects parking outside ever since I got my license at 16 is driving me to clean up the garage by this weekend so we can use it. I also kidded James that any neighbor who gets a peek at the items in our garage may think we’re running a small appliance shop. Besides the oven and deep freezer pictured above, on the other side of the garage is a washer, dryer and fridge. We are very fortunate that we have some rudimentary storage shelves in the garage that will come in very handy. I just have to move these bags of stuff to the appropriate room. 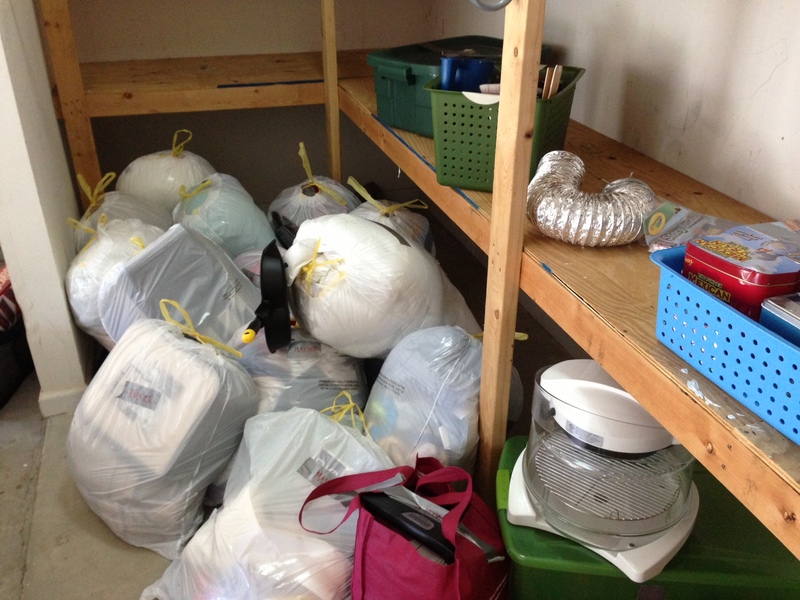 And yes, trash bags of belongings is a little redneck, but so much cheaper than boxes for things like comforters and linens. Why waste a box? The kitchen is officially unpacked and has already gotten much use. In the next few days, I’m hoping to get by the nearby granite place to see when we can upgrade our countertops. 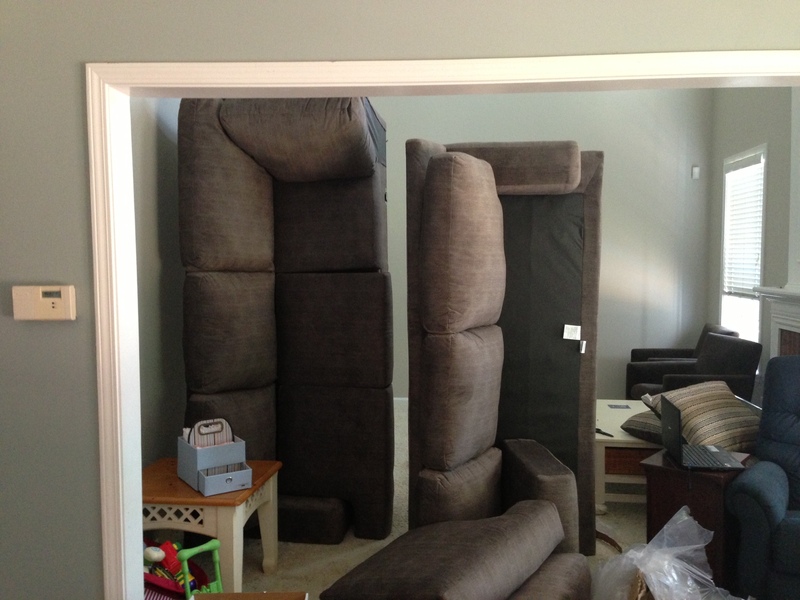 I have wanted a sectional for years and years, but one would never fit in the condo. So I got one from American Signature Furniture because I liked the look and size, and it wasn’t expensive but should hold up for years with kids. This time, I was sure to get the stain protectant coating. It’s hard to tell from this picture, but the fabric color is a grayish taupe blend. 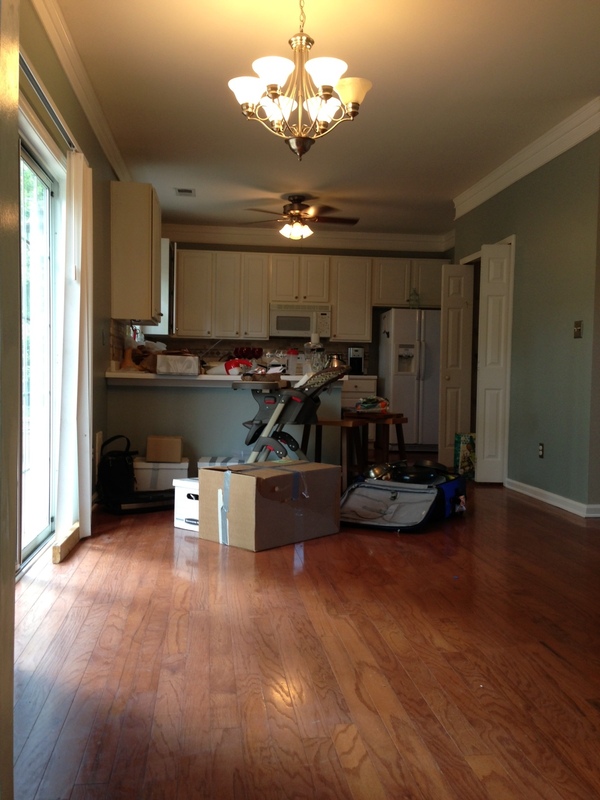 We closed on the house May 24, and I didn’t start calling around to painters until a couple days before closing. 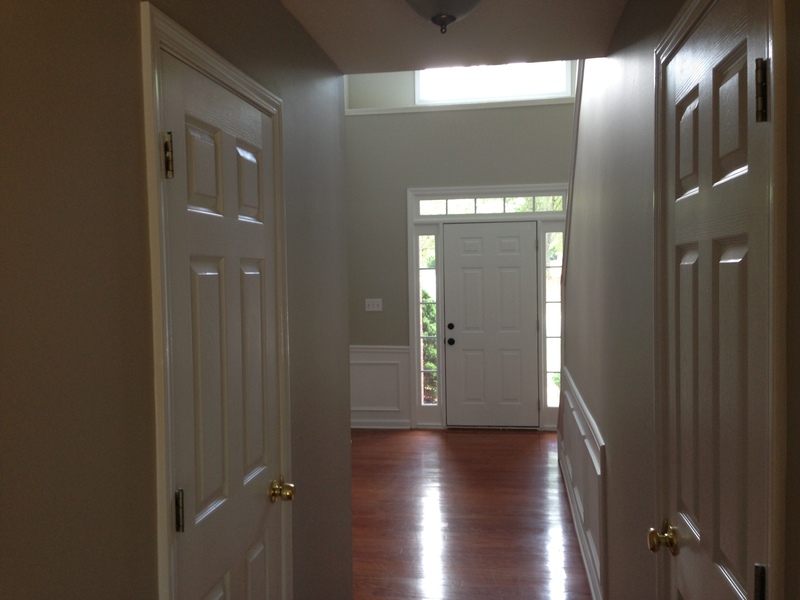 Luckily I stumbled upon Pro Painting Contractors from some great reviews, and when I called the owner he managed to squeeze me in within a week of closing and before we moved into the house June 3. This was no small feat since right now is painters’ busy season. 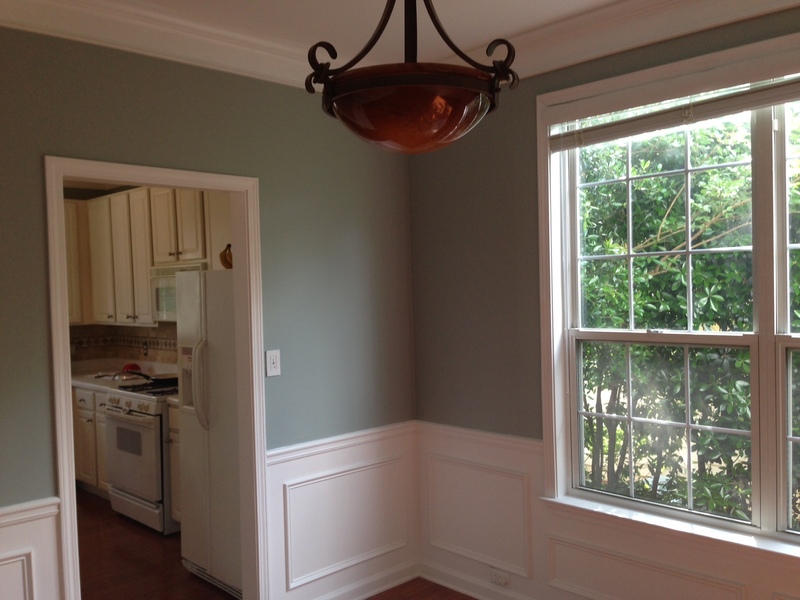 I’ll show more of a room by room view once we get everything in, but I stuck with only two colors for the whole house: Benjamin Moore’s Revere Pewter (a greige color) and Behr’s Frozen pond. Downstairs, the kitchen, breakfast room and dining room are Frozen pond, and the living room, front entry and James’ office are all Revere Pewter. These iPhone pictures don’t really do the colors justice, so I’ll have to use James’ nice camera to get a few shots in the next week or two once the furniture is situated. After getting up at 4:30am on moving day and working, working, working, I was exhausted by mid afternoon. Just because you hire movers doesn’t mean you don’t work. I probably took 50 trips up and down the stairs loading my car with odd items that wouldn’t fare as well in the moving truck. At one point that afternoon, I looked in the mirror and I think I hallucinated because I could swear little Beau had dropped, and for a minute I freaked out that moving was going to send me into early labor. So I sat down to take an hour break and refuel. When I looked in the mirror later, I realized that I must be going crazy. So far, so good. Little Beau is staying put. Monday night, I managed our first dinner in the new house. It wasn’t gourmet, but tasty and much better than take-out. 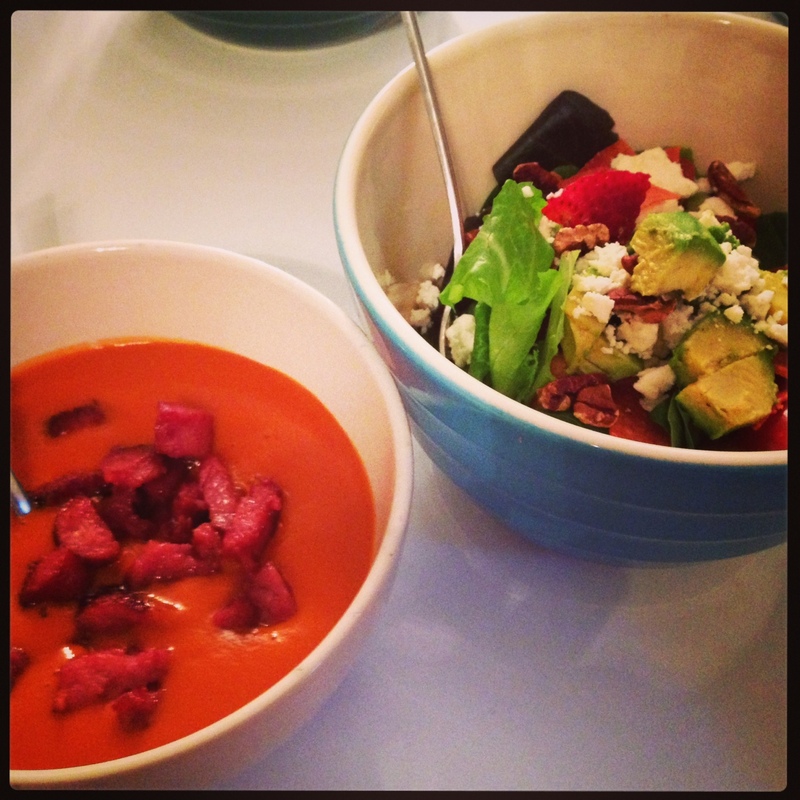 It was simply a mega salad with tons of toppings, and a bowl of Roasted Red Pepper and Tomato soup (Trader Joe’s brand) with some sauteed smoked sausage. 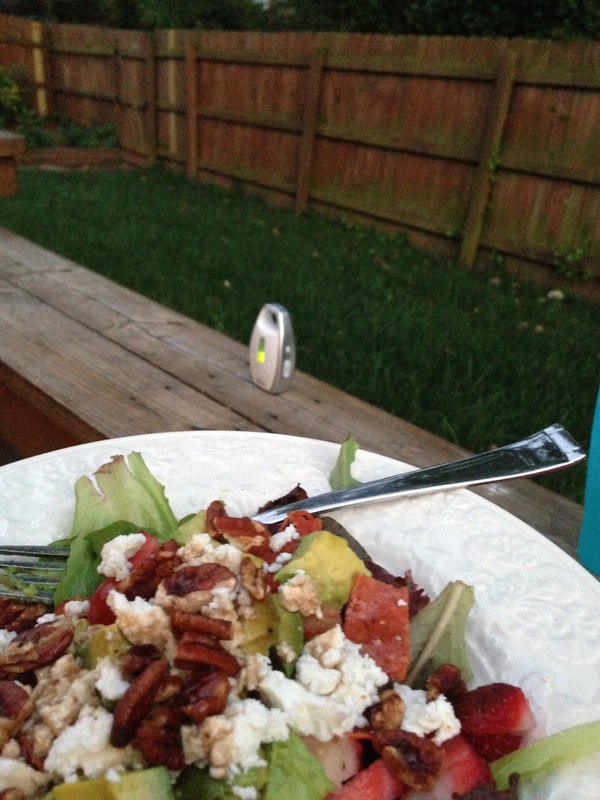 And because the weather had cooled off (thanks to eating dinner close to 9pm), I was able to sit outside on my deck to enjoy the cool breeze while I ate–thanks to modern technology and the invention of baby monitors. I foresee James and I doing this a lot in the new house, especially once we get deck furniture and a grill! And not to forget JM in this whole process, but he’s been quite the trooper with the move, despite cutting teeth and cutting back from sleeping 12 hours a night to only 10. He’s had his share of fussiness during the past week, but I’m hoping that once the house is in order and he acclimates and the worst of the teething is over, we’ll all be able to rest a bit and enjoy our new abode. 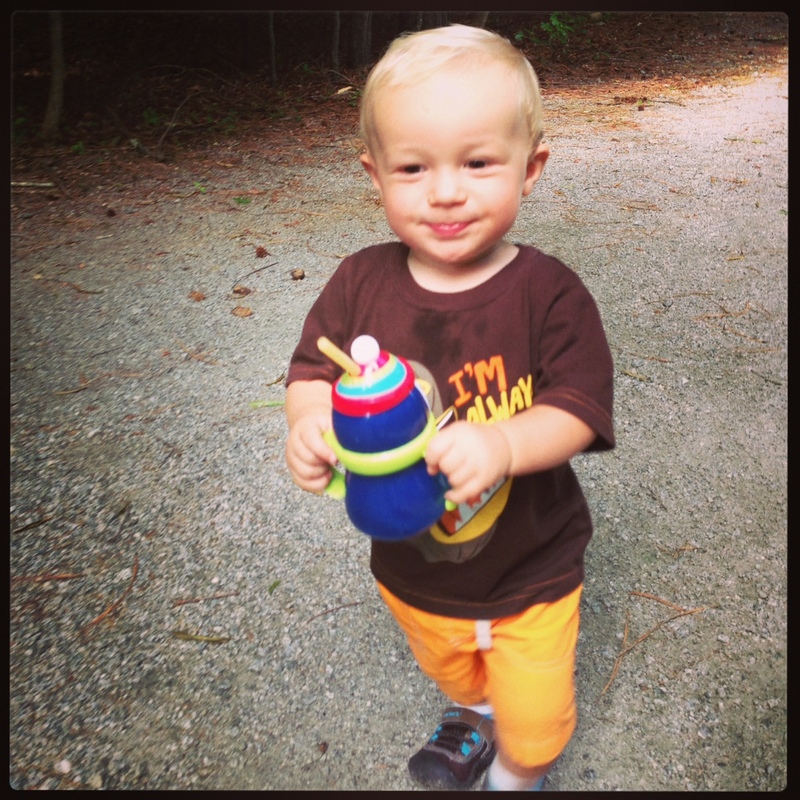 One thing is for sure, he loves the neighborhood walking trails in Legacy Park. If nothing else, we have that in our back pockets as a cure for any fussiness.